July 31st to August 9th. Little late on the update, as it's been a busy month and took forever to go through all the photos (I'm still not done). 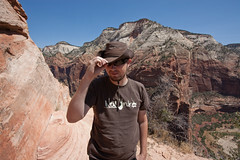 Flew back to the SLC for my friend Nick's wedding and then we spent seven days camping in southern Utah. It was an awesome trip but much too short. I think I could spend months in southern Utah and not be satisfied. I took hundreds of photos with two cameras, including my new Canon D10 which I had purchased as a camera that can be abused and be used in the water. I picked out 13 of my "keepers" and made a flickr set. The photo to the right might be my favorite one, its hard to choose. Most of the picks were from Bryce because it's very photogenic and the colors stand out really well on their own. I did the trip without a tripod (except a gorilla pod) and it finally convinced me I cannot keep hand-holding landscape shots, and need to give high priority to a packable tripod. It was a helluva trip with quite a bit of hiking. Hikes in the Escalante area included Calf Creek falls (the "utah-3" photo on the flickr set was during this hike) and the petrified forest loops. Most of the time it was insanely hot in the Escalante area, until the clouds and some light rain came in after our 3rd night. The original plan was to transfer camp to Bryce Canyon National Park, but we decided since it was close enough to our Escalante spot–which was uncrowded and had showers–that we'd just stay there and shuttle to the Park. At Bryce we combined the Navajo Loop hike with the Peekaboo Loop hike into a sort of figure-eight so we'd only have to hike down into the canyons once. It was a very scenic hike and all the Bryce photos in the flickr set came from this hike (6 to 11). It was so scenic we were probably spending too much time taking photos and had to pick up the pace to make it out of there in good time. 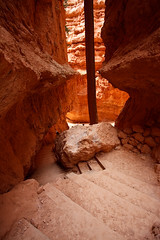 The only other hike we did in the Bryce area was the short Mossy Cave hike. Despite not living up to it's name, it was a good hike and included some more waterfall play. Packing up camp(in the rain), we moved on to Zion National Park, the entire reason we planned the trip. We managed to secure a backcountry permit for hiking the zion canyon narrows from top to bottom, a 16 mile hike through–as the name implies–narrow river canyons. It starts out crossing the river what feels like a hundred times and the last three miles are so narrow, with 1200 canyon feet walls on both sides of you, and nowhere to hide from a flash flood. At this point you are no longer crossing the river but wading through the river, sometimes waist deep, and over slick polished rocks. I've done the hike before with my father about 10 years before (maybe to the day) and he describes the last three miles as "amazing and beautiful but walking on wet bowling balls never ends and you just become annoyed" and that still seems true to me too. It's a wonderful hike and I'd do it every year if I could. This time the water was much higher than it was 10 years ago and there was some spots where swimming was necessary. Donna is turning out to be an amazing sport when it comes to following me around and trying out some of my hobbies and this is by far the most adventurous thing I have put her through. She was quite shaky with all the slippery river wading and crossings and we had to take our time with them, but she was getting it down towards the end. It was a near-perfect trip and I wish i could do it all over again. It was a much needed vacation from work and much better than spending it at a resort or in a hotel. I can't think of many things I'd rather do than spend a week in a tent in the Colorado Plateau. I've been to Zion a few times already and it still meets my expectations and beats any of the other amazing places I've visited this year, and that includes Big Sur.